Once upon a time there was a knitter named Frizzylocks who loved Cat Bordhi’s Cables & Corrugations Socks and wanted to knit them more than anything in the whole, wide world. Now Frizzylocks was one of those knitters who never follows patterns. She always changed something, or tweaked something else, or just plain threw the pattern away and did her own thing. But because Frizzylocks loved the Cables & Corrugations Socks so much, she really wanted to knit them just exactly the way the pattern said to. So she started knitting, and she knit and she knit and she knit. She followed all of the directions until she was ready to turn the heel, and then she tried the socks on. And, although the gusset seemed a bit wide at the top, for the most part they fit pretty well and the length was great. Smiling happily, she began knitting again, following the heel instructions. What Frizzylocks hadn’t realized when she tired the socks on was that the heel portion of the pattern would add an entire stitch-pattern repeat, making the socks longer, and the set-up for the sock would add quite a few more increases and make the heel even wider. When the heel was finished, Frizzylocks tried the sock on again. It was too long. It was way, way too long. And the heel was way wide because Frizzylocks has skinny heels. And Frizzylocks was no longer smiling. So that’s enough third person fairytale. Because this, unfortunately is most decidedly not a fairytale of any kind. The sock was way too long. The heel was way too wide. There was just no getting around it. You can see it in the first picture up there. It was huge. The width through the foot was OK, though. And that was certainly nice. You will recall that when I first knit the toes I did not trust the pattern and added extra increases and the toes ended up way, way too wide. I think these socks hate me. And really, I like them a lot and I am trying not to take it personally! 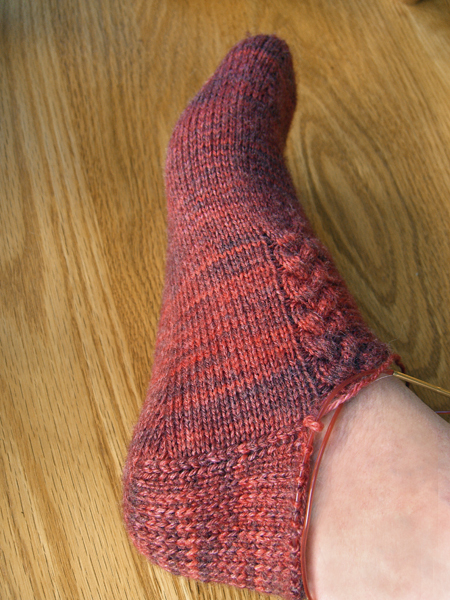 So, anyway, I frogged the heel. 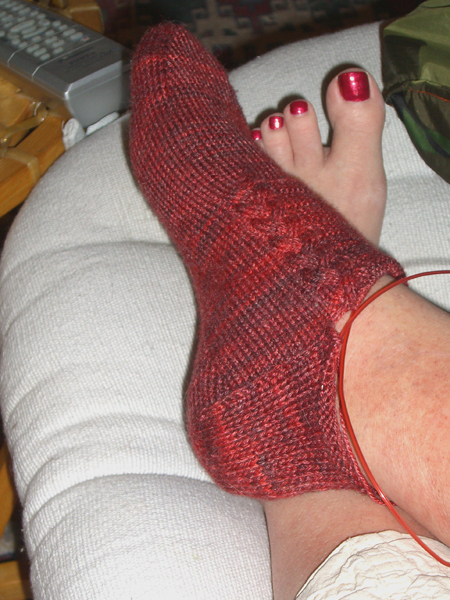 I frogged the heel at knit night at Tangle, and there were gasps all around as I took them off the needles. But it doesn’t fit, I explained. Alice tried the glass slipper red sock on. It fit her. Alice offered to take them off my hands (or feet, as the case may be) once completed. I politely declined. Alice started knitting on a gorgeous basketweave sweater that’s been a UFO for a couple of years now because she’s not feeling the love. I suggested that sweater might be swapped for socks. Alice politely declined. There’s something about the phrase for good measure that does not bode well when my pursuits are concerned. You will, perhaps, remember the never-ending moebius? The one that 11 knitters fit into? Yeah. I cast on just a few extra stitches for good measure. Third times a charm, gentle reader. I knit one more pattern repeat. 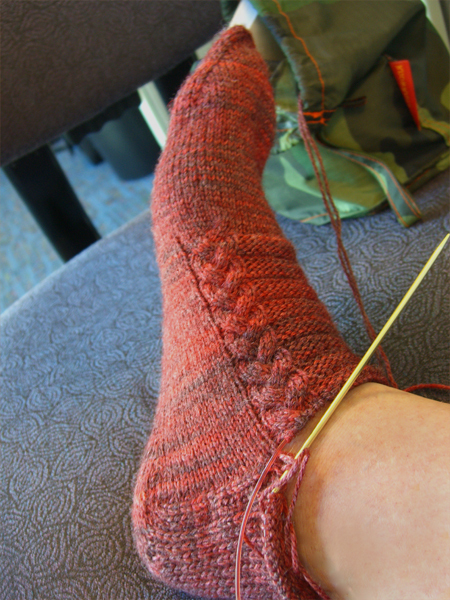 Then I stopped and worked my standard heel. It’s not exactly like Cat’s heel, but it’s visually similar. Actually, the flap is pretty much the same, but the turn is different. And, as you can see from the third picture, this one is just right! The heel fits, it’s the right length. And Frizzylocks is very happy. Now to do the same thing on the other sock, and I will be back in business heading up the legs. I may need a few extra stitches on the ankles once I get the cable going up the back. But I’m not worried about that at all since I know from experience that increases are really easy to hide in the purls along the edges of cables. I almost titled this post Why I Don’t Follow Patterns, but then I went into my little fairytale instead. But that did send me off on a little navel-gazing tangent — Why don’t I follow patterns? Is it just that I’m a rebel? Or is it fit? Or process? Or maybe all of these? Probably the last. But following the Cables & Corrugations pattern has been difficult, even though I fully intended to follow it. I just keep wanting to stray, and the heels gave me the perfect excuse. What about you, gentle reader? Do you follow patterns? Why or why not? Are you more enamored of the process of knitting itself, or is it the finished objects that you create that keep you coming back for more? Would you prefer to knit objects similar to those you have knit before, or would you rather knit something completely different? When things go wrong — patterns have errors, the swatch lied, you loath the way the yarn is knitting up, the thing looks sucky on you — what is your reaction? Are you angry at the time lost or the pattern author? Are you discouraged or invigorated? Do you want to fix it at any cost and make it work, or bury it 20 feet deep and never see it again?